Winner of the IPPY Bronze in the Illustrated Children’s Books for all Ages category. The "IPPY" Awards, launched in 1996, are designed to bring increased recognition to the deserving titles published by independent authors and publishers. Can you find the camouflaged images in Judy Larson’s artwork? The paintings in this book have hidden images and the stories that accompany them will give you the clues. Often the concealed image is of a companion, but sometimes it is of an animal that shares the same fate. For example, the Alaskan wolf and the wild horse, both hunted to near extinction; or the great bald eagle — the spirit of freedom — hidden within the painting of a wild horse. Other paintings tell Indian legends and stories of great Native American leaders. 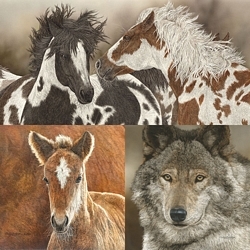 The artist’s favorite companions in hidden images are the horse and the wolf, her two most beloved species. Filled with natural history facts and the Native American way of relating to animals and the environment, the lively free verse by Kathleen Kudlinski gives readers clues to finding the hidden images. Two themes converge in these pictures and stories: the lives of animals in the wild and the fate of Native Americans who lived in harmony with the natural world. The artist’s spectacular scratchboard painting technique is perfect for telling these stories within stories and portraying the beauty of the wilderness and the animals who call it home.